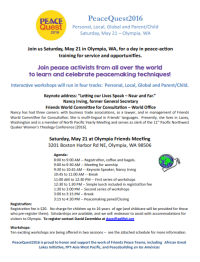 In May 2016 Olympia Monthly Meeting hosted the annual meeting of Friends Peace Teams, a Spirit-led organization working around the world to develop long-term relationships with communities in conflict to create programs for peacebuilding, healing and reconciliation. FPT’s programs build on extensive Quaker experience combining practical and spiritual aspects of conflict resolution. Each year on the Saturday of their annual meeting , FPT organizes PeaceQuest, a day long celebration in peacemaking techniques for folks in the area of the hosting meeting, members and others interested in joining them. We are lucky that in 2016 that was us! We were joined by FPT peace activists from all over the world and the USA for learning and celebrating peacemaking techniques for a day in peace-action training for service and opportunities. PeaceQuest2016 was proud to honor and support the work of Friends Peace Teams including African Great Lakes Initiative, FPT-Asia West Paciﬁc, and Peacebuilding en las Américas. 8:00 to 9:00 AM–Registration, coﬀee and bagels. Nancy has had three careers: with business trade associations, as a lawyer, and in management of Friends World Committee for Consultation. She is multi-lingual in Friends’ languages. Presently she lives in Lacey, Washington, is co-clerk of Olympia Monthly Meeting, a member of North Paciﬁc Yearly Meeting, and serves as clerk of the 11th Paciﬁc Northwest Quaker Women’s Theology Conference . Interactive workshops ran in four tracks: Personal, Local, Global and Parent/Child. The registration fee was $20. No charge for children up to 16 years of age (and childcare was offered to those who per-register children). Scholarships for adults were available if needed. Olympia Monthly Meeting found accommodations for visitors from out of town. This was a very special event! Download the flyer and workshop schedule – click here or on the image below to download it.